Halloween is known as a kid-favorite holiday, full of spooky fun and lots of candy. However, it can also present many opportunities for injury, as children take to the streets in pursuit of trick-or-treat goodies. The Trauma Department at Jamaica Hospital Medical Center urges families to stay safe this holiday. Statistics show that roughly four times as many children aged 5-14 are killed while walking on Halloween evening compared with other evenings of the year. Also, falls are a leading cause of injuries among children on Halloween. According to Dr. Sebastian Schubl, Medical Director of Trauma at Jamaica Hospital, parents can help minimize the risk of children getting injured at Halloween by following these safety tips from the American Academy of Pediatrics, the Centers for Disease Control and Prevention, and the National Safety Council. • Travel in small groups accompanied by an adult. • Use costume plastic knives and swords that are flexible, not rigid or sharp. • Cross streets at the corner, use crosswalks, and do not cross between parked cars. • Wear clothing or costumes that are bright, reflective, and flame retardant. • Consider using face paint instead of masks which can obstruct a child’s vision. • Avoid wearing long, baggy, or loose costumes or oversized shoes to prevent tripping. • Supervise the trick or treat outing for children under age 12. 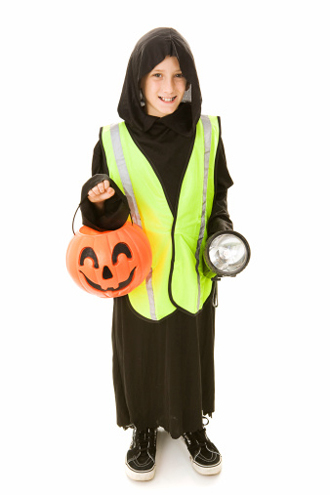 • Parents and adults should ensure the safety of pedestrian trick-or-treaters. • Make sure children under age 10 are supervised as they cross the street. • Exit driveways and alleyways slowly and carefully.